Ask about our SPECIAL WEEKLY RATE for June 5-12. Our villa is a 1-bedroom unit directly facing the ocean at Hilton Head Beach and Tennis Resort---a resort located between Port Royal and Palmetto Dunes---a perfect mid-island location for easy access to shopping, dining, grocery stores, and all local attractions. Tenants have written wonderful notes in our guest book, including comments about how "clean it is", how "the pictures don't do the view justice---it's so much better--awesome", and how our villa is "one of the best units they ever stayed in". 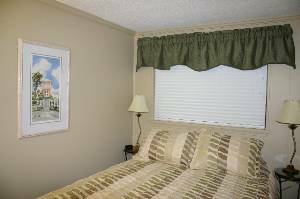 We have a Queen size pillow-top mattress, granite bathroom vanity tops, a wall-mounted hair dryer, a La-Z-Boy sofa in the living room, lots of storage, a 32ï¿½ flat screen LCD TV with high definition, and DVD/VCR player. We include some beach chairs and boogie boards for you to use so you wonï¿½t have to lug your ownï¿½a big plus! 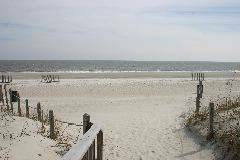 Located in the popular ï¿½Bï¿½ building, our second-floor unit looks directly over the ocean/beach, while also having a spectacular view of the largest, oceanfront swimming pool on Hilton Head. Sit on our deck at the bistro table, have your morning coffee, and enjoy the beauty and serenity of the ocean. Watch your favorite movies from our video library in the LR or the bedroom. 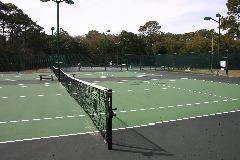 Enjoy the resortï¿½s excellent restaurants, cabana bar, on-site fitness center and tennis courts, and other daily activities. The resort also has a convenience store, bike rentals, shuffleboard, etc. You will find that you wonï¿½t have to leave the resort for anything (that is, unless you want to!). So come, kick back, breathe that ocean air - and enjoy one of your most wonderful and comfortable vacations ever! Our unit has this awesome ocean view from the minute you walk in. My husband and I thoroughly enjoyed our stay in your condo during the week of July 11-18, 2009. The location is fabulous. Gorgeous view from the balcony. Rental process so very organized and easy. Very accurate description on the site. We had a great vacation. The condo had a beautiful view of the pool and ocean. We were impressed with the cleanliness and upgraded furnishings. This is the best value for vacation rental at Hilton Head. We have vacationed there several times. We love the island. We will certainly return and hope to rent from you in the future. Carrie, we recently stayed in your condo in April, 2007. Your condo is GREAT! Our family stayed at HHBT back in 1999 and the unit we stayed in was the same size condo where they had the bunk beds in the wall. Those were great then for our small children but I love the fact that you removed those and made a huge closet out of that space. This was more than enough room for my husband and I. I loved sitting on the balcony reading my book and listening to the ocean waves in the background. I watched children at the pool play and it was such a joy. I even saw a rabbit running through the grass. I definitely plan to return (hopefully sometime again this year) and bring my grandson. He loves to swim and this would be the perfect outlet!! The bed was absolutely comfortable and so was the huge couch. We enjoyed watching a couple of your movies you had on hand. We didn't do any cooking while we were there because we went to relax so we ate late breakfast's and then had dinner each evening at the local restuarants. The Old Oyster Factory was GOOD! I would suggest anyone that stays at Hilton Head visit there to eat. To anyone looking for a great place to stay on Hilton Head, this is definitely the place. It is just as neat and clean as you see it in the pictures. Great job with the color scheme. Again, thanks for letting us "relax" in your home away from home. We stayed in your condo May 26-June 2, 2007. You have a great condo. We have been going to Hilton Head for 8 years and your condo was by far the best we have stayed in. View from the deck was great and the close proximity to pool and beach was wonderful. Our boys (5 and 8) loved the boogie boards. We have already forwarded your contact information to some friends who are interested (and may have already contacted you). We look forward to coming back next year. Thanks again. 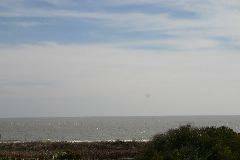 It was the first time we stayed on HHI and we had such a pleasant stay at Carrie's lovely Condo.The view is perfect. I want to go back as soon as possible. Linen and Towels: A+, as good as I have ever had away from home. Overall decor: A, some of the units we have been in in HHBT seemed to have cast off furniture and accessories, but yours had a much more personal feel. I felt more at home than I usually do in such situations. View: A-, a third floor view might have a slightly better view. Balcony: B-, but nobody in HHBT could get above a B because the balconies are too small, but yours scored high for the fact that you offered both comfortable "sit and read" chairs and elevated "sip coffee and watch the ocean" chairs. 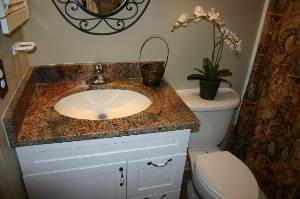 Bathroom and Bedroom lighting: B-, you could use more light in the bathroom for applying make-up, and another lamp in the bedroom (owner's note: a new floorlamp recently has been added). So much has happened since we got back from vacation that I haven't had time to let you know what a great vacation we had at your condo. You were right when you said I would love the ocean view. We have been going to HH for over ten years and this was the best condo we have rented. The weather wasn't the best (a little chilly and cloudy), but we still had a very nice vacation. Thanks to your very nice cozy condo. We would love to rent it again next year in May. Hey Carrie, I just wanted to send a quick note to say a great big thank you for the use of your condo. It was wonderful. The pictures and description didn't do it justice. We really enjoyed the view, the large beach, the spectacular sun rises, the pool and most of all the condo. We had no problems from getting our car passes at the gate to getting in the condo. The condo was exceptionally clean and in order. The pillow top mattress was wonderful. I have never slept so good on vacation. Most of the time we have a terrible time ajusting to the hard uncomfortable mattress, but not this time. I slept like a baby. We also really enjoyed the living room furniture. The couch was very comfortable and the the large TV was great for the hubby. The extra touches to the condo made us feel right at home. The beach towels, chairs and boogie boards were a wonderful added bonus. I loved the fact that I didn't even have to go outside for a great view. I could see the ocean and watch the sun come up from the comfort of the couch. We also really enjoyed Hilton Head Island. I watched the sunrise and walked on the beach every morning and explored the island on my bike very evening. Anyway I really meant to make this short, but it is just impossible to explain to you how much we enjoyed our vacation and your condo. Renting from you was sooooo much easier than renting from an agency. Thank you for caring about us as real people and helping to make our vacation so easy and wonderful. I have never gotten such personal attention when renting a vacation condo. Good luck with the rest of the season. We will be in touch and will absolutely be going back to Hilton Head and would not consider staying anywhere but HHB&T 231B. I have been singing praises for HHI and your condo all morning to all my friends and co-workers. I stayed in Carrie's condo in July with my six-year old son. Carrie was wonderful! She worked with me when I needed to change my week, making my son's week on the beach wonderful instead of miserable! I have been going to HH for over 20 yrs and this is one of the best weeks I have ever had. The condo was very nice and very comfortable. I enjoyed the view and my son loved the pool. We had a wonderful experience all around and will definately go back next year! My thanks again to Carrie for being so understanding and easy to work with. Her response time is amazing. This condominium was absolutely perfect for my husband and I to rent. The pictures do not do it justice. The surprisingly large balcony faces the ocean and this unit is closest to the beach in the complex. The condo has everything one may need! We will definitely be back. The owner, Carrie is wonderful. This is the first time we rented from find vacation rentals and it was a superior experience. The location of the condo is mid point of the island. (Excellent beach, two great pools, and a great beach bar) Two people looking for some R&R with an ocean front retreat with superior golf less than 5 minutes away cannot go wrong with this little gem. I just hope that this unit will be available the next time we wish to vacation at "Carrie's". Beautiful condo! Probaly the best value I've gotten on Hilton Head. The owners advertising is very accurate. 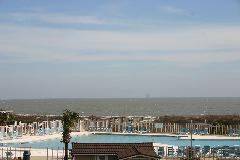 The view and location are wonderful-directly oceanfront. The balcony has two wonderful lounge chairs and a bistro table for eating. The interior has been redone, all new flooring, new kithchen appliances, new paint, new bathroom, several new pieces of furntiture. Very high quality sheets-100% cotton. New mattress on bed and new sofa bed. Next to my favorite stretch of beach on Hilton Head. Fabulous price for such a nice condo. Good for two adults and one or two small children. This condo is by far one of the nicest in Hilton Head. The view is spectacular and the furnishings are beautiful. Exceptionally clean and in a quieter area of Hilton Head. Love this place and the owners are great to deal with. You can't go wrong. We just stayed at this wonderful condo. It is directly on the beachfront with a lovely balcony. It was renovated in January 2005 and what a beautiful job they did. The kitchen was well equipped with all new appliances. The owner was so accomodating and easy to work with. The main room has a brand new comfortable couch that pulls out to a double bed and a big screen tv that our boys loved(easy hook up on the front for playstation. )The bedroom had a queen bed with a tv and vcr. My family of 4 stayed there and it was a little crowded, but manageable for the price we paid. It would be ideal for a family with one child or a couple wanting to get away. The pool was directly in front of the condo so if you have kids you can see them from the balcony. 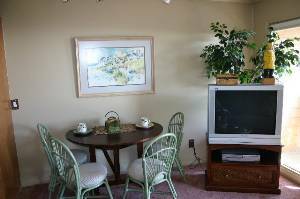 We will recommend this condo to friends visiting Hilton Head. We visited March 19th through March 26th. The view was fantastic and the amenities were first class. We certainly plan to make another trip in the summer and our choice will be this unit. 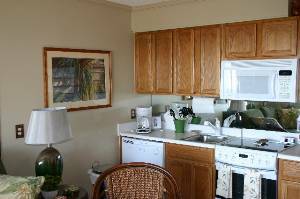 The unit is ideally located in the center of the island, making it convenient to everything Hilton Head has to offer.